Who doesn’t travel with a ton of electronic devices? Even if you only travel with a phone and tablet or laptop, multiply that by the number of people in your family and you’ll quickly see why the average hotel room or cruise ship cabin simply doesn’t have enough outlets to recharge all our electronics. However, there is a device that offers an economical solution. The device is called the “POWR▲MID.” As you’d expect from the name, its shape resembles a pyramid and comes in three configurations. The Power Center and Surge Protector comes with six grounded 120-volt outlets, 1080 Joules of surge protection, and a four-foot power cord (MSRP $30.99), and in a version that includes two USB ports and a six-foot cord (MSRP $43.99, on sale for $37.99). A similar device, the Powramid Air Power Center and USB Charging Station (MSRP $47.99, on sale for $39.99), also has six A/C outlets, two USB ports and surge protection but has a slightly lower profile. The units carry a five-year connected equipment $100,000 limited warranty, and are available in white or black. According to manufacturer Accell, all three units feature Power Stop technology that automatically stops conducting power once the devices are fully charged, thus reducing the risk of damage in the event of a power surge. In addition, both feature advanced X3 MOV (Metal Oxide Varistor) technology that detects surge conditions and reacts by directing excess energy away from equipment through the electrical grounding system. The MOVs are encased in fireproof material, fully containing the heat created by a power surge and eliminating the threat of fire. Accell provided me with a six-outlet power center and surge protector so that I could evaluate it and share my first-person experience. Its packaging makes the Powramid seems much larger (and potentially less convenient) that it actually is. Once freed from its foot-long cardboard box, the device measured less than six inches in diameter, was less than three inches tall, and weighed 1 pound, 1.5 ounces. At that size, it can be conveniently tucked into a suitcase, laptop bag or carry-on. 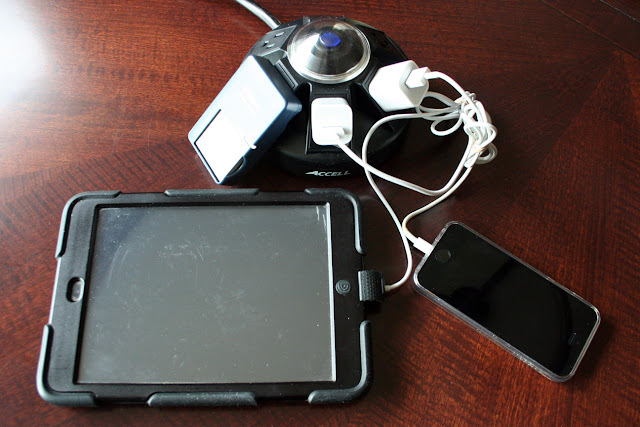 As shown in the photos, it easily accommodated my iPad, iPhone and camera charger with room to spare should I need an outlet for my wife’s cell phone or my laptop. All devices have a rated capacity of 15 amps, though most chargers for battery-powered devices draw only a fraction of a single ampere. Measuring the draw using a Kill-A-Watt meter showed that the iPhone drew 0.04 amps during charging, while the camera battery charger drew 0.01 amps. The biggest energy hog among my traveling electronics was my laptop, which drew a whopping 0.3 amps while booting up, and about a third of that while passively charging. There are two facets worthy of note. First, the pilot light on the unit is very dim and difficult to see in full-light situations. However, the pilot lights on most chargers or phones will easily confirm that the device is switched on and working. The second facet has to do with its usefulness when traveling outside of North America. Unlike computer power blocks or many battery chargers, the Powramid is rated only for 120 volts A/C. If it were possible to develop a device that could accommodate voltages from 100 to 240 volts, the device would be extremely useful for international travel. In such cases, coupling the Powramid with a plug adapter would give travelers multiple outlets suitable for their North American devices. With that single caveat, I will definitely be packing my power center for my next trip within North America. For a price of, at most, less than $40, perhaps you should, too. Even if you don't travel often, the Powramid makes a convenient charging station for the home or office. More information is available on Accell's website.